Since George Michael died, I’ve been enjoying all of his hits, but none of them more than this one. Listening to it now, it’s painfully obvious how much it’s about George Michael’s struggles with his sexual orientation. I wonder whether he was being deliberately coy in the lyrics, or if he just wasn’t yet fully in touch with his identity. Being gay in the eighties must have been a nightmare. This is the funkiest song that George Michael ever wrote, which is saying something. Was he the funkiest white British guy in history? Quite possibly. There are five layers to the drum pattern: a simple closed hi-hat from a drum machine, some programmed bongos and congas, a sampled tambourine playing lightly swung sixteenth notes, and finally, once the full groove kicks in, the good old Funky Drummer break. I include a Noteflight transcription of all that stuff below, but don’t listen to it, it sounds comically awful. George Michael uses the Funky Drummer break on at least two of the songs on Listen Without Prejudice Vol 1. Hear him discuss the break and how it informed his writing process in this must-watch 1990 documentary. 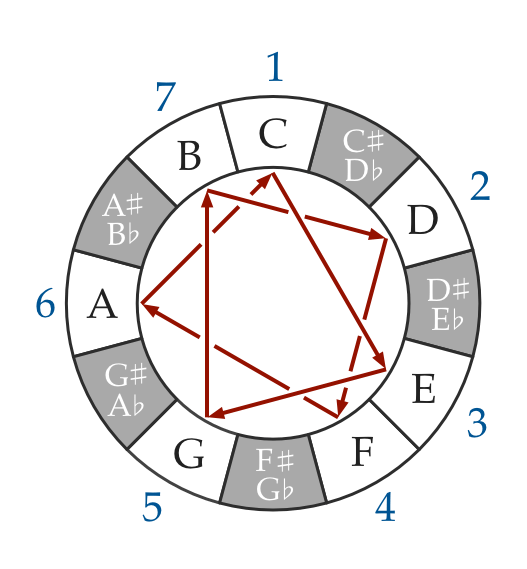 Harmonically, this is a boilerplate C Mixolydian progression: the chords built on the first, seventh and fourth degrees of the scale. You can hear the same progression in uncountably many classic rock songs. For a more detailed explanation of this scale and others like it, check out Theory For Producers. The rhythm is what makes this groove so fresh. It’s an Afro-Cuban pattern full of syncopation and hemiola. Here’s an abstraction of it on the Groove Pizza. If you know the correct name of this rhythm, please tell me in the comments! There’s a switch to plain vanilla C major, the chords built on the fifth, fourth and root of the scale. Like the chorus, this is standard issue pop/rock harmonically speaking, but it also gets its life from a funky Latin rhythm. It’s a kind of clave pattern, five hits spread more or less evenly across the sixteen sixteenth notes in the bar. Here it is on the Groove Pizza. This section unexpectedly jumps over to C minor, and now things get harmonically interesting. 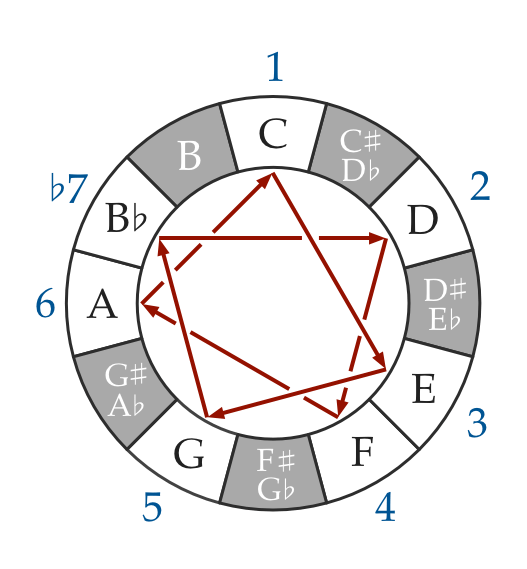 The chords are built around a descending chromatic bassline: C, B, B-flat, A. It’s a simple idea but with complicated implications, because it implies four chords built on three different scales between them. First, we have the tonic triad in C natural minor, no big deal there. Next comes the V chord in C harmonic minor. Then we’re back to C natural minor, but with the seventh in the bass. Finally, we go to the IV chord in C Dorian mode. Really, all that we’re doing is stretching C natural minor to accommodate a couple of new notes, B natural in the second chord, and A natural in the fourth one. The rhythm here is similar but not identical to the clave-like pattern in the verse–the final chord stab is a sixteenth note earlier. See and hear it on the Groove Pizza. I don’t have the time to transcribe the whole bassline, but it’s absurdly tight and soulful. The album credits list bass played both by Deon Estus and by George Michael himself. Whichever one of them laid this down, they nailed it. “Freedom ’90” has an exceedingly peculiar structure for a mainstream pop song. The first chorus doesn’t hit until almost two minutes in, which is an eternity–most pop songs are practically over that that point. The graphic below shows the song segments as I marked them in Ableton. The song begins with a four bar instrumental intro, nothing remarkable about that. But then it immediately moves into an eight bar section that I have trouble classifying. It’s the spot that would normally be occupied by verse one, but this part uses the chorus harmony and is different from the other verses. I labeled it “intro verse” for lack of a better term. (Update: upon listening again, I realized that this section is the backing vocals from the back half of the chorus. Clever, George Michael!) Then there’s an eight bar instrumental break, before the song has really even started. George Michael brings you on board with this unconventional sequence because it’s all so catchy, but it’s definitely strange. Finally, twenty bars in, the song settles into a more traditional verse-prechorus-chorus loop. The verses are long, sixteen bars. The prechorus is eight bars, and the chorus is sixteen. You could think of the chorus as being two eight bar sections, the part that goes “All we have to do…” and the part that goes “Freedom…” but I hear it as all one big section. After two verse-prechorus-chorus units, there’s a four bar breakdown on the prechorus chord progression. This leads into sixteen bar bridge, still following the prechorus form. Finally, the song ends with a climactic third chorus, which repeats and fades out as an outtro. All told, the song is over six minutes. That’s enough time (and musical information) for two songs by a lesser artist. A word about dynamics: just from looking at the audio waveform, you can see that “Freedom ’90” has very little contrast in loudness and fullness over its duration. It starts sparse, but once the Funky Drummer loop kicks in at measure 13, the sound stays constantly big and full until the breakdown and bridge. These sections are a little emptier without the busy piano part. The final chorus is a little bigger than the rest of the song because there are more vocals layered in, but that still isn’t a lot of contrast. I guess George Michael decided that the groove was so hot, why mess with it by introducing contrast for the sake of contrast? He was right to feel that way.